A metro Detroit mother says her 2-year-old’s severe medical disorder has been devastating. 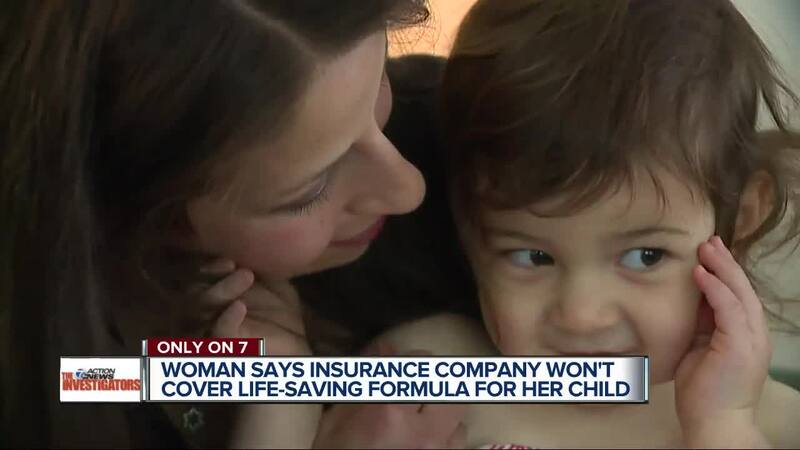 Even worse, she says Health Alliance Plan, which sells health insurance in several states, has refused to cover a crucial formula her daughter’s needs. For 2-year-old Abby Bortnick, the food you would find in the refrigerator is dangerous and could cause serious health complications. Her mother says it’s part of the reason she’s been in a battle with the health insurance company, for more than a year. The extremely rare digestive condition is treated differently in other states. Michelle Bortnick says more than 20 other states along with the FDA consider the formula needed by Abby to be medical food. However, she says HAP has labeled it a supplement they won’t cover. Without the formula, Abby’s body treats food as an allergen and rejects it. The trouble has existed for more than a year and the costs have been hundreds of dollars a month. “We have been battling with HAP for so long and without help, she will die,” says Michelle. Due to HIPAA laws and out of respect for our members’ privacy, HAP cannot comment on specific health information of individuals.